Votre navigateur ne supporte pas l'élément audioelement. Music breaks all barriers ~ this was apparent when the Alliance Française de Delhi, in collaboration with ICCR, presented a performance by the Lorenzo Naccarato Trio under the umbrella of the International Jazz Festival. Founded in 2012 with Adrien Rodriquez and Benjamin Naud, the Lorenzo Naccarato Trio became popular, on the emerging jazz scene through music festivals. The Trio won the Jazz Festival in Oloron in 2015 and at Paris in 2013; they were twice finalists at the jazz festivals in Baie and Vannes. Their first album was released on 11 March 2016 under the label Laborie Jazz. So, how did the group come about? After studying classical piano for 10 years, Lorenzo Naccarato began studying musicology at a university in Toulouse in 2007. Specialising in jazz and improv music, he conducted a research project on Thelonious Monk and took part in Master classes under Laurent Cugny, Franck Avitabile, Kenny Barron, Enrico Pieranunzi and Claude Tchamitchian, who became a determining influence on his approach to composition. The story of Benjamin Naud, on the drums, is somewhat similar. After a Bachelor’s degree in classical musicology, Naud entered the jazz section of Toulouse conservatoire, in 2007, to study drums. He participated in improvisation workshops by Richard Calléja and then completed his studies with Christian Salut, at the Dante Agostini school. Between 2009 and 2012, he became the drummer of the blues band Mannish Boys and gave more than 150 concerts in Europe. Passionate about the South American repertoire, he recorded an album with Brazilian author, composer and interpreter Carlos Papel in 2011. Looking for ensembles providing more space for improvisation, he discovered the compositions of Lorenzo Naccarato. Their musical affinity confirmed, they decided, in 2012, to form a trio with double bassist Adrien Rodriguez. In Delhi, the concert’s concept of kinematic jazz, in that the notion of movement lies at the heart of its musical exploration, was an aspect keenly appreciated by the audience and received with curiosity and intrigue. It was amid a green expanse of land, illumined with pink, green, blue and yellow lights that Delhi was having its date with jazz. Ecstatic people, young and old, gathered at Nehru Park for the 7th Delhi International Jazz Festival, organised by the Indian Council for Cultural Relations. After the ceremonial lighting of the lamp, the fest was started by a French band, Lorenzo Naccarato Trio. For 25 minutes, the crowd was treated to the melodious rhythm of the piano, bass and drums. Tapping and grooving, the crowd was seen swaying to the crescendos and the diminuendos. Joining them on stage next was 4 On A Swing, a band from Kolkata. The evening was brought to a close by a jazz group from Spain, Alfonso Aroca Flamenco. "Jazz need not be understood, but it has to be enjoyed"
Lorenzo Naccarato Trio, who performed in Chennai, Bangalore, Ahmedabad and Pune as part of their five-city maiden international tour in India, found India to be a place that is constantly moving. Apart from the language changes with each city, they also took interest in the onion dosa, idli, parantha, palak and chana-parantha and the famous 'cha'. Lorenzo, sharing one incident from his tour, said, "I met this tuk-tuk driver and wanted to have real cha, on the streets. So I asked him, let's have cha together. Since he didn't know English, he brought another man, Ravu, who was our translator. He took to me to a fantastic cha and kokora (pakora) shop. We spent good five hours together." Having been influenced by classical Italian music as well as French, Lorenzo thinks that jazz needn't be understood, but enjoyed by everyone." Lorenzo Naccarato, the lead keyboardist of the Lorenzo Naccarato Trio, is known for his cinematic jazz. They have won several accolades including the Jazz Springboard in Oloron 2015. They were finalist in the Jazz in the Bay 2014, Jazz Springboard in Saint-Germain-des-Prés 2013 and also the Jazz Springboard in Vannes 2013. Their first album was released in March 2016.
Who or what is god according to you? Lorenzo I prefer to use the word presence. If we accept and work on our sensitivity and emotions, I think we can learn to find a feeling of evidence in our existence. What has been your most devilish encounter that made you (or not) a believer? When France football team beat the Italians in 1998 World Cup. That was totally devil action, for me. Then 2006 victory of Italy, and maybe it made me believe in some justice, more than in god’s existence. Is god is a man or woman? Why? I think god is like a sound, or a resonance. More like a sort of wave of acoustic material. Which musician do you want god to bring back from the dead? Certainly music by Thelonious Monk, because listening to him has already changed my way of considering music, and life. If you had a choice to argue your case for heaven and hell, what will you focus on? I don’t believe in heaven and hell. I’d focus on my French-Italian talent in cooking food, specially. I can convince god to let me be a chef in heaven, especially making Tiramisu! Which actor do you want god to look like? Between god and devil, who would you want as your bodyguard? Thelonious Monk. Or maybe my Italian uncle, Zio Roberto...Only the brave knows! Build a star, and then travel over a comet through the cosmos. If you were asked to perform for an audience of gods what would it be about? I’d play some piano solo ballad, maybe Round Midnight or In A Sentimental Mood. And then, go prepare some pasta and drink red wine. A quirky habit that you have in terms of being spiritual or a god believer? I like the number three. Whenever I am scared of taking a plane, for example, I touch the wings three time before I get in. The Lorenzo Naccarato trio, comprising of Lorenzo Naccarato on the piano, Benjamin Naud on the drums and Adrien Rodriguez on the bass, is going on their first international music tour and the artistes have chosen our city first ! Bengaluru has never run short of jazz experiences but when the city’s music lovers witness the Lorenzo Naccarato Trio this weekend, the encounter promises to be one of a different kind. Comprising Lorenzo Naccarato on piano, Benjamin Naud on drums and Adrien Rodriguez on double bass, the Trio puts together an interesting amalgamation of influences and sounds that give their jazz a cinematic vibe. At the heart of the Trio's sound, frontman Lorenzo says, “Is ‘Kinematic Jazz’ – a word I chose years ago to describe how my compositions should be listened to and played.” The concept explores music as a cinematic experience themed on aural interactions made purely by the Trio’s music alone. On their first international tour as a trio, the group is excited about the prospects of their visit. “A lot of work and energy has been put into making this adventure and dream come true. It also means the three of us get to make good memories together,” says Lorenzo. Looking back, Lorenzo says their journey has had a lot of struggle. “Being a musician is never easy. If we talk only about the music, it requires energy, practice and patience to become a good musician. But not only do you have to play your best, you also have to be able to sustain your project economically. For the trio, since the beginning, we are a team that is really close and we complement one another. This journey has been full of emotions and great encounters.” In the future, the Trio hopes to tour China and prepare for their second album launch. “We also hope to create a real link with India and come back as soon as possible to promote the album. French jazz band Lorenzo Naccarato Trio has chosen India for its first international tour. Comprising of pianist Lorenzo Naccarato, drummer Benjamin Naud and bassist Adrien Rodriguez, the trio was formed in 2012 when Lorenzo, who was in the last leg of his musical studies at a university in Toulouse at the time, met the other two to discuss music. Lorenzo recalls those early meetings. “I had the conviction that my music would work perfectly with theirs, and that our personalities would complement each other,” he says. Since then, they have released an album, recorded a second and are now set to tour through Bengaluru, Ahmedabad, Pune and Delhi. The three musicians have been following a consistent method of producing new music. Led by Lorenzo’s piano tunes, the process elaborates with Adrien and Benjamin chipping in with their compositions. “I usually find the ideas for a new composition in a piano solo — be it a rhythmic cell, a melody or a harmonic sequence. I keep improving it until I’m satisfied and then I play it to the other two. This is where they are brilliant, since they understand and propose a lot of orchestration and arrangement ideas,” Lorenzo explains, adding that his influences range from Frédéric Chopin’s classical music to Erik Satie’s jazz tunes. The Trio has an impressive list of accomplishments so far, having won at festivals in Oloron (2015) and in Saint-Germain-des-Pres, Paris (2013). Lorenzo explains how the concept of movement or motion is at the core of their musical philosophies. “Our music has always been evolving from the first day. Our focus on the notion of movement prompts me to describe our music as ‘kinematic jazz’. I like to think about music like a place that is always in mutation, while at the same time always telling a story that you almost recognise,” he explains, recalling his first performance as a 15-year-old French immigrant in Scalea, Italy, with Paris-based jazz fusion musician Andy Emler as one of his mentors.Despite his French origins and his Italian memories, however, Lorenzo admits to liking the musical culture of Andalucia the most. “The Spanish community has strong flamenco influences and the people are very receptive to our way of playing. That said, I’m also interested in the way Indian musicians manage to immerse the audience in a deep meditative state before they start playing some incredible rhythmic and powerful combinations,” he explains, adding that they will also be releasing their second album next year. "Heavy Rotation" is still circulating on the waves of France Musique... What a pride to finish 2016 being on Banzzaï, The jazz on France Musique. A huge thank-you to Nathalie Piolé! In 2012, an French-Italian pianist, with strong knowledge of classical music and years of research about Thelonious Monk, decided to team up with two French musicians, Adrien Rodriguez (bass) and Benjamin Naud (drums), to create his first trio, producing this opus full of lyrism, energy and invention. Even in the moments of quietness, we feel an amazing vital pulsation and a constant interaction between the three musicians, who complete and duel each other. The piano can take on moto continuo functions, the bass can incarnate a Hendrix electric guitar, and instead of setting the tempo, the drums become a timbre kaleidoscope.. Organized by the university's Artistic and cultural center (CIAM), "Jazz à la Fabrique" presents the repertoire of now professional jazz musicians educated at Toulouse University. Lorenzo Naccarato studied classical piano for ten years before enrolling in musicology in Toulouse. 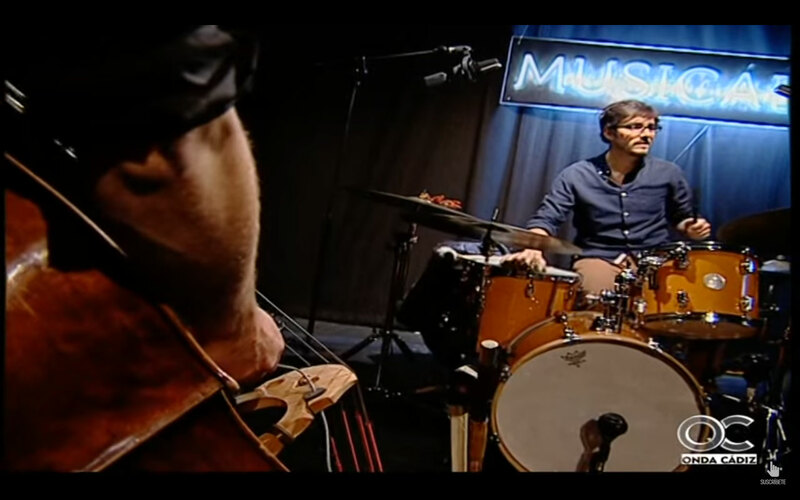 After meeting Benjamin Naud (drums) and Adrien Rodriguez (double bass), he created the trio that bears his name in 2012. In four years, the band has been laureate of several springboards including Saint-Germain-des-Prés in 2013 and Jazz à Oloron in 2015. Their first album came out in 2016. In the kinematic jazz offered by this young trio, the loops deliver a sound scenario in which it's easy to slip in. The Laborie Jazz label is back with a new find. 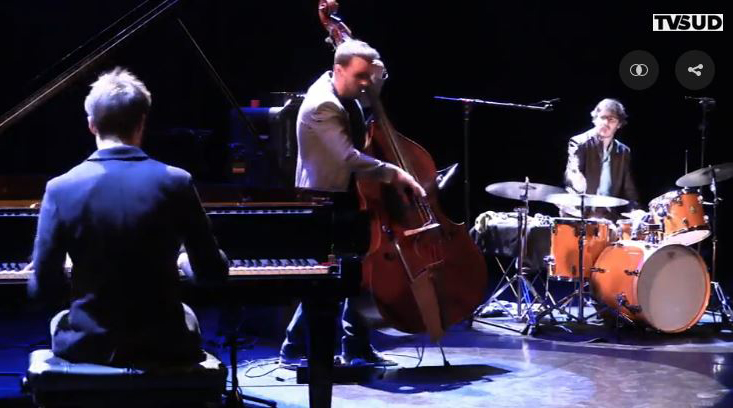 Young pianist Lorenzo Naccarato leads Benjamin Naud (drums) and Adrien Rodriguez (double bass) into a twirling trio around his confident and enthusiastic playing. The 5 tracks of the album definitely bear Lorenzo Naccarato's sparkling musical touch. Komet could be an introduction that sets the tone for the other compositions, reminding us somewhat of Shaï Maestro as he started working under the same label. This album, full of well-balanced melodies -whatever the tempo- reveals a strong musical conviction. Most attractive. Laborie Jazz is indeed a talent spotter enriching French jazz. Do not miss Lorenzo Naccarato Trio. Jazz sur son 31 celebrates its 30 years of existence. The Toulouse festival offers a very dense programming in different venues of the region. The line-up includes famous artists like Manu Katché, Popa Chubby or Ibrahim Maalouf, but also young talents, some of them local like the young Lorenzo Naccarato Trio from Toulouse. What's jazz? It's a lovely way to approach music… According to me, jazz favors the notions of sharing, adventure and boldness! Where's the best place to listen to jazz? Anywhere is fine, but do it with your heart! Any anecdote to share about jazz? While they're recording "The Man I love", Monk and Miles Davis don't understand each other at one point, and Monk stops playing: that's his most famous silence. If I were a flower, I would be a snowdrop, my mum's favorite! I'm happy to be a musician, to make a living playing the music that drives me, with people I love… I have no regret whatsoever! I think that nowadays you need a lot of patience and determination to be able to grow and progress on the jazz scene. I've sometimes felt weary of all the efforts needed to find gigs, keep the trio alive, make a name for myself... But I tend to look ahead of me, so there's no room for regrets… On the contrary! Which albums? Yesterday You Said Tomorrow by Christian Scott, Live in Tokyo by Monk and Another One by Mac DeMarco. Which books? Anything I can find from Italo Calvino, Tintin albums and one Sherlock Holmes. Which movies? City Lights by Charlie Chaplin and Buena Vista Social Club. Above all, continue to musically develop within the trio: since I became a professional musician -I was nineteen then-, it's the first time I work with a record company, a manager and a publisher… For the first time, I can dedicate myself entirely to musical practice and creation! And I'm eagerly waiting to record my second album at Studio Sextan, still with Laborie Jazz and the trio! To love. To play. To live. The three kids are made of the same stuff as major trios like The Bad Plus, E.S.T., Kühn Jenny-Clark Humair. This is an actual band where the pianist is also an amazing composer, the double bassist Adrien Rodriguez shows his uniqueness and draws incredible sounds from his instrument, with the bow or through effects. Benjamin Naud, the drummer with velvety hands, is attentive and elegantly wraps all the stories told by the band to take us with them. Jazz News dedicated half a page to the trio recently. As we scheduled them, we did not imagine they would reach the forefront of the French jazz scene in just a few months. New rotation, with Charlotte Bibring and Patrick Derlon, to kick off the month beautifully, as always on FIP. A brief stop on Radio Iguanodon Gironde, in Sabato Bosco's radio program. And again, in heavy rotation on FIP! Thanks again to Jane Villenet and Patrick Derlon, still on FIP. We are proud to have one of our tracks (Heavy Rotation) programmed in "Club Jazz à FIP", the mythic radio program! by Jane Villenet and Patrick Derlon, on FIP. It would be fair to say that Lorenzo Naccarato is a young promising pianist and that his trio, with eponymous album "Lorenzo Naccarato trio" (label Laborie, distribution Socadisc), is very encouraging. Fair but also harsh, for the intention behind this music is certainly higher than that. Starting today, starting right now. The pianist expresses not only the world he is coming from -classical and XXth-century music, Debussy's, Ravel's, Satie's- but also an elusive world, therefore very personal and very beautiful, that's specific to him. He's accompanied by Adrien Rodriguez (b) and Benjamin Naud (dm) who generate a kind of balance, but a delicate one, since they are constantly bringing themselves into play and challenging themselves -which perfectly matches the pianist's intention. In 2010, in a master class by Claude Tchamitchian, pianist Lorenzo Naccarato meets double bassist Adrien Rodriguez. Two years later, they form a trio with Benjamin Naud on the drums. The first album, Lorenzo Naccarato Trio, is released on Laborie Jazz on March 10th 2016. It contains five tracks by Naccarato. The trio is not centered on the pianist and tries to collectively develop the themes: with its ostinatos and the dry and muted stroke of the drums, "Komet" verges on pop; from a pedal point on the piano, followed by Eastern-sounding loops, "Animal Locomotion" unfolds on a repetitive movement, with a powerful but minimalist bass and a tingling drum; "Breccia" is a tasteful ballade; the splashes on the cymbals and the emphatic bow give "Mirko Is Still Dancing" a majestic character; with sustained riffs and circular motifs on the piano, and the double bass sounding like an electric guitar, "Heavy Rotation" has a rock feel to it. Lorenzo Naccarato Trio presents an attractive, dense and well-mastered music. Based in Toulouse and laureate of several springboards, the ensemble led by young pianist Lorenzo Naccarato is fully in line with a certain contemporary aesthetic in piano trio: catchy melodies (Animal Locomotion), hypnotic riffs on the left hand, binary rhythms inspired by rock, electronic effects (mainly on the double bass)… But what sets them apart from the masses and keeps the audience awake at all times? A real knack for construction and dramaturgy: each of the five pieces of this very short opus (32 minutes!) becomes a kind of mini-sequel full of twists and turns. Here the ostinatos' motive power isn't idle as is often the case with so many bands, but instead constantly drives us to some other place. If improvisation occupies a moderate space in the process, the identity of a band is clearly present. We can only encourage them to investigate even further. Like the photograph Eadweard Muybridge, pioneer of motion studies at the end of the XIXth century, our music develops motifs. It is figurative enough to do without background images projected during live performances. Freely inspired from E.S.T., Christian Scott or Avishai Cohen, this music is above all very demanding, for its timber research ("Heavy Rotation", where the double bass under distortion required setting up new electromagnetic micros) and for its compound meter management ("Breccia", breach in Italian, with an 8, 7 and 3-beat cycle). 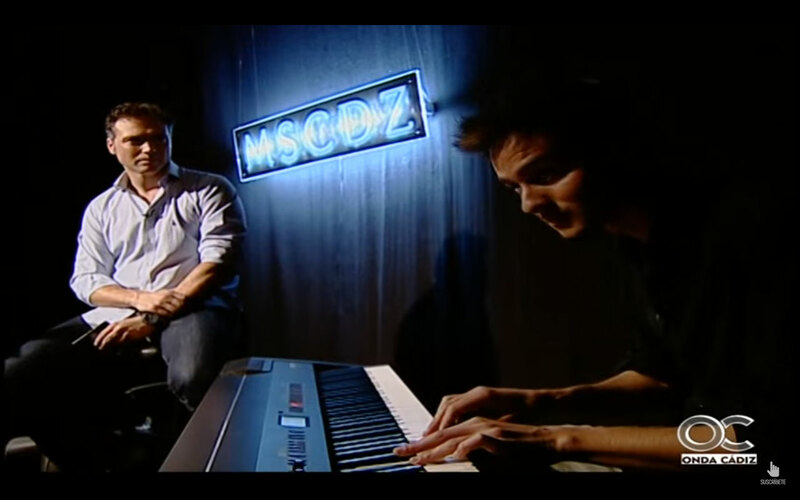 Lorenzo followed the ad hoc curriculum (ten years of classical piano, a master's in jazz at the musicology department of Toulouse university, with a work on silence in Thelonious Monk's music). But so did his companions: Adrien Rodriguez (29 years old, double bass) graduated from Toulouse Conservatoire, and Benjamin Naud (32 years old, drums) from the musicology department of Poitiers university. Together, they are laureates of two springboards: Jazz à Saint-Germain-des-Prés in 2013 and Jazz à Oloron in 2015. The trio forged himself a personality not only through contact with mentors like Enrico Pieranunzi, Claude Tchamitchian or Andy Emler. But thanks to his experience, from 19 years old, of chic night piano-bars in Toulouse, Lorenzo has become a professional able to consistently give his best... even in front of a sparse audience, as at the Athéna in Ergué-Gaberic (Brittany) in November 2015. Pianist, but also arranger since the show "Les Inoubliables" at the Théâtre National de Toulouse in February 2014, he successfully performed the adaptation for octet of Ennio Morricone's and Nino Rota's themes. It is now obvious where his mastery of contrast comes from. These last few years, we've often heard about Lorenzo Naccarato's trio, especially in the Toulouse area. They performed at the Jazz sur son 31 festival, also in Querbes, Millau, Luchon, Muret… Not to mention Vannes, Saint-Germain and Oloron springboards, where they made a very good impression. This promising ensemble is releasing a first album. An EP, actually, and if there is one (relative) demerit to point out, it is the length of the record, just over 30 minutes. We are hoping this is a mere appetizer before a more substantial album. Philippe Fayret did compare them to E.S.T. and Avishai Cohen. These references may be too prestigious to be immediately relevant: there are plenty of bands, especially in a piano/bass/drums configuration, brought up on the music of the Swedish trio or the American bassist. Also, referring to E.S.T. or Avishai Cohen is always too pompous. Too much praise can prove unhelpful. Still, it is difficult to avoid mentioning these bands as Lorenzo Nacarrato's trio chooses a repetitive music based, among other things, on motif development. Adrien Rodriguez's style on the double bass is not exactly that of Dan Berglund. He doesn't use effects pedals so much, especially distorsion. However, sound transformation is a key element in Adrien Rodriguez's playing, as is the bow's frequent use. But the most convincing analogy with the extremely famous Swedish trio is the link between jazz and pop. For the trio's music doesn't swing -at least not very often. Benjamin Naud's drums play a huge role in this, bringing more power than swing, especially in "Komet" and "Heavy Rotation". This eponymous album is a nice piece of work, but really too short to quench the thirst for emotions provided by the trio. We are eagerly waiting for more. Hair tousled just the right amount, wearing a well-cut jacket, Lorenzo, 26 years old, has a broad smile on his sweet, highbrow face. Nothing surprising, as his first album is being released, and we are about to talk about his passion. Nothing seems to rejoice more the little prince of Toulouse jazz. To describe his work, he weighs every word. As he weighs each note when composing -reminder of his musicology studies, years spent figuring out scores, nights spent studying patterns for piano, his preferred instrument. Today, it seems that the young man has always been a researcher, a scientist even. His liking for accuracy and precision is apparent in his compositions for the trio that he formed: "I want my music to be legible, I want to be understood. I've always tried to achieve clarity in my work." A perfectionist, no doubt. Lorenzo Naccarato Trio, created in 2012, is much in line with his aesthetic research: "In the trio, everything is brought to light, everything is bare. You have to pay attention to every detail, nothing can be hidden", he explains. Refine, keep the essentials, and not play for the sake of playing. The pianist has worked on the visual aspect from the beginning. For him, matching his music with images is essential. When he finds out about photograph Muybridge, famous for his work on motion studies, it is a revelation: "In his sequences, there is musicality and silence. Muybridge develops motifs, which I'm doing with music." His deep reflections on his music, put in perspective with visual arts, lead him to name his work "kinematic jazz". In other words, a music where movement plays a major part. What about on stage? Lorenzo and his trio partners, Benjamin Naud and Adrien Rodriguez, try to produce an ever-lively music. "The major thing is to play music together. Always inhabit what we are doing and not be afraid to put ourselves in danger." This explains their success among the public, for example last July during the Jazz à Oloron springboard (that they won). "We set the audience on fire! ", says Lorenzo, eyes shining, as if it happened just yesterday. However, the real recognition is coming this year, with an album release on March 11th. It seems the young musician still finds it hard to believe, but he will have to get used to it, as this is just the beginning. Three musicians and a trio full of promises. I sense the joy of playing. Harmony, attentiveness, understanding also. More than a trio, it's a band… sharing the same collective action philosophy. And if, for the moment, most compositions come from Lorenzo Naccarato, the other two musicians wonderfully digest and carry them, making them theirs while considering them from different and personal points of views. With the intention of producing a melodic jazz music, very much pop, the Naccarato trio also masters variations around a simple phrase, generating an exhilarating tension. Trio worth following! Faced with the profusion of records published each month, it seems right, even necessary, to mention a few. They deserve, through their qualities, their originality, to be underlined. Of course, they are not the only ones to stand out. But one would need 48 hours per day to listen to everything and claim to be exhaustive! We will just cite one among the most worthy of interest. The album of a young pianist, Lorenzo Naccarato, whose performances in trio, in Toulouse and in the South-West, generated an understandable curiosity amongst jazz lovers. Not due to an exceptional piano technique: nowadays, all young musicians out from music schools or conservatoires show a command of their instrument that their elders did not always have. Many, like Naccarato who studied classical piano for ten years, have a solid background. And they are curious enough to be open to all kinds of music. What sets him apart (and his trio with Adrien Rodriguez and Benjamin Naud) lies elsewhere. True, the conventional piano-bass-drums model is present. But the harmony is such between the three partners that the processing of the leader's compositions shows a rare unity in sensitivity and inspiration. Each musician, part of a collective approach, conveys the pianist's ideas according to his own personality, providing counterpoints, developments or comments. So much so that the audience thinks they are witnessing some spontaneous creation whose cohesion results from a genuine complicity. There is no doubt that this first eponymous album imperfectly reflects the impression of extreme freshness produced during concerts. But not only did it allow us to discover young musicians full of talent, it is a way of better grasping, even analyzing the pianist's way. It can certainly not be reduced to that of his masters, be they stated or implicit: Thelonious Monk for his use of silence, Jacky Terrasson for his percussive touch and rhythmic figures. Even Keith Jarrett for the use of reiteration. If that reiteration may sometimes seem a little too systematic, it serves as a springboard for the development of his imagination -which draws as much on jazz as on classical and contemporary music. This is Antaeus drawing strength from earth, and such resurgences are often heavenly for the audience. Our Trio makes an apparition across the Atlantic, in the Jazz Bazar program by Alain Lalancette on Radio CKIA. Adrien Rodriguez, from Lot department, double bassist for four years, joined Lorenzo Naccarato Trio. The Laborie Jazz label decided to produce their first album. (...) Their album is a true delight, to be listened to in loop. Captivating, powerful, aerial, each track is a gem. "Breccia" starts as a whisper, then takes off -the sound of the double bass, round and muffled, answering the piano and the drums' breath. "Mirko is still dancing" is stirring, with its out-of-sync and colorful sound. In "Heavy rotation", a deep sound, a piano phrase, and we're out towards absolute -like a release. We hadn't had such a pleasant surprise for a long time. The trio is ready to set off for stages in Toulouse, Marciac, Limoges, Lyon and Mauritius. As I sat listening to Lorenzo Naccarato's album, I thought about that town far away, with the dusty streets. About the rare object found in its outdoor market. A town whose name escapes me now. I thought about the breaking dawn's pearly light, about the opalescent sheen of the object brought back from a trip and set on the Louis XV chest of drawers. Lorenzo's album is a real joy to listen to, which happens much too rarely nowadays. A bit more touring and experiences, and he will become an immense musician. Thank you for such albums. Rumbling of the double bass. Slow and dense, the deep scratching of the bow hair against the strings opens the concert; the instrument's vibration, as it reaches the audience, physically reminds them of the difference between live and recorded music. While the double bassist's left fingers enthusiastically hit the strings or brush them to extract harmonics, the drums take the floor with a variety of rhythms, tones and nuances, as if actually talking, whispering or, at times, blowing up. Far from sticking to ride pattern or walking bass, the two instruments complete the piano's obsessive tunes. The latter —body open, bare strings and hammers— is exposed to the gestures of the pianist, who plays his riffs as if the keys were burning hot but, out of pleasure or provocation, was back at them with increasing confidence and purpose. Then, seeming to apologize, the musician bends until, eyes level with the keyboard, gaze riveted to the keys, he comforts them with his touch for the space of a falling scale or a few notes. Rooted in jazz, the young trio develops its style by calling upon other musical techniques or styles and by exploring the instruments' potential. The improvising musicians make each piece vary with every performance, expressing some instantaneous quality, their actual feelings, emancipating themselves from a too rigid structure. Their music features rather conceptual passages and unseizable tunes. Still, it offers itself to the public in a manner that's quite intuitive, even obsessive, especially through the melodies on the piano. Each piece seems to have grown from a few notes' loop —a theme that inexorably repeats itself, like a minimal riff in electronic music. Initiating a kind of movement, this tune establishes itself, gets shattered, then lands in the hands of the next musician —until all instruments join in. Several atmospheres emerge during the course of this movement, between grand gestures and meditative moments, chases and melancholic wanderings. Then, images, signs of an almost cinematographic narration, surface from the illustrative aspects of this kinetic music —as the trio likes to define it. At the en of the first piece Animal Locomotion, the heat from the lighting and concentration has made the young men take their jackets off. Lorenzo, the pianist, presents the 4-year old group and explains their musical intentions. His speech is simple, scattered with a few autobiographical data. He briefly gives musical points of reference and interpretation paths, without saying too much, just enough for the audience to visualize the images or ideas behind what they hear. While the compositions are from Lorenzo, it's the meeting of the three musicians and their collective work that actually give birth to the ensemble. The concert includes several very expressive solos, but it is not about showing off any technical prowess. Their dexterity serves the global form of each piece, during which they converse or come together to develop an idea. Resulting from the exploration of their respective instruments —many aspects of which are exploited— and from an inventive and sensitive construction, their repertoire conveys a feeling of movement within the sound patterns, but also in the form of communication that seems to exist. Like in a conversation, ideas and feelings circulate, get exchanged, both between them and with the public. Their universe is revealed to us not only through their music, but also through their playing: you can of course hear this circulation or communication idea, but you can also see it. When they make eye contact before placing the next sentence with utmost synchronization. When the double bassist, the instrument nestled against him like a dance partner, nods and smiles at the section just played by his colleague. And finally when the pianist, looking away from his hands racing over the keyboard, smiles at the audience, conveying the pleasure, the unpretentious pride of what's being told. Can you tell us a little bit about the trio? Where, when and how did it start? Lorenzo It all started in 2012 in Toulouse. At the time, I was studying Musicology at the university, with a specialization in Jazz. This is where I met Adrien (on the double bass), during a masterclass by double bassist Claude Tchamitchian whose generous and simple approach was key in my decision to compose and start an intimate project. As for Benjamin, who plays the drums in the trio, we just happened to rehearse together one day at the university. I knew straight away he was perfect for the project: he had the same way of feeling music, plus he could make me laugh and surprise me. So there it was, we had our trio. Your musical education, quite impressive, and your professional experiences are quite varied. What brought each of you to jazz? Benjamin followed a Classical curriculum in Musicology in Poitiers. Very fond of South-American and more generally Latin music, he’s the oldest of the three, he’s traveled quite a bit and has played in various ensembles. He often refers to his meeting with New-York trio Medeski, Martin & Wood as a major turning point in his approach to jazz and trio playing. Adrien’s background is less standard, since he started double bass rather late -and intensively- at 19. He also plays with Pauvres Martins, a local band, and I think he chose the Jazz curriculum in Musicology to get closer to modern music. As for myself, I came to jazz through Cuban music and the Buena Vista Social Club movie which made a big impression on me when I was 14-15 years old. Very moved by pianist Rubén González, then by Bebo Valdés and others, I started playing pieces that were not from the classical repertoire, and most importantly I embraced improvisation. Another highly significant meeting was with Italian Giovanni Mirabassi at 18, and I’m grateful to my mother for that: she contacted him explaining that I dreamt of meeting him and that my birthday was coming soon. I spent a whole day in Paris with this great artist. That was when I decided to become a musician and composer, rather than an interpret in Italian, my initial choice! The jazz music you do is kinematic, elegant, ethereal, emotional. It definitely doesn’t need anything else, but maybe you’ve thought of adding video or other art forms to live sessions? It’s true that there’s always a rich and interesting space to explore between different art forms. These past few months, we’ve been looking into our scenography and thought about including projections. But we finally ruled out the idea, for two reasons. First of all, because people from the public often come to us saying that our music is very visual and appeals to their senses, and that they’ve seen or felt such and such things. If we project images onto our music, we might prevent those personal fantasies and evocations from emerging. Secondly, because we consider it more beneficial to work on our presence on stage, on the way we communicate with each other and with the public, on the way we "narrate" an entirely instrumental music. Your new 5-track EP is both delicate and impetuous. But it doesn't seem to fully convey the improvisation that's part of your concerts. Am I right? You're absolutely right. The album includes improvisation sections, but obviously, during a concert, we can really let go. We recorded this new EP at the Cinémathèque de Toulouse and we mostly kept the first takes. Despite rough technical conditions, I'm very happy about the result. During concerts or at rehearsal, it's amazing to play with Benjamin and Adrien, since we all cultivate a kind of permanent renewal of ideas, of matter... The pieces are constantly changing, and we rarely play them twice the same way. Every instrumentalist has his own space, for example there's a long solo where Benjamin plays the drums with bare hands like a percussionist; on many occasions, Adrien is by himself on the acoustic double bass where he plays with the bow or uses effects. The kind of improvisation we practice may not be so obvious at first, because our performance is not about the show, unlike many bands we've seen in jazz springboards or festivals. It's more about the energy. We want our music to remain accessible and to touch a maximum of persons. What about your goals/wishes, now that this EP is being released? We want to go on working as we're doing now, giving concerts on a regular basis - which is quite something already. At the moment, we're mostly performing in the region, although we've been touring in Brittany and we will be in Spain soon. Also, we'd like to play in modern music festivals or scenes, in front of people who might not necessarily be outright jazz enthusiasts. Last summer, for instance, we played in museums, at the Ombres blanches library... And we're hoping to get some support as far as administration, sales, etc. are concerned, for these tasks are exhausting and take up a lot of time and energy that we'd rather spend on our creation process. If your music could change something in the world, what would it be? Last summer, we won a springboard prize at Festival Jazz à Oloron and we played at the off festival for forty minutes. It was a very emotional moment, because the public gave every piece a standing ovation, and the communion we felt was just amazing. I believe that if our music and the way we make it exist lacked generosity, then this connection wouldn't be possible. On that occasion, it was simply exponential! The energy we received from the public that day gave us enough satisfaction and motivation for months! So, to answer your question, I'd say: show more generosity and gather people. If you were a painting? A poem? A film? We won't forget the Lorenzo Naccarato Trio which free improvisations have their sights set as much on French classical music, with Fauré and Satie, as on Enrico Pieranunzi or Giovanni Mirabassi.